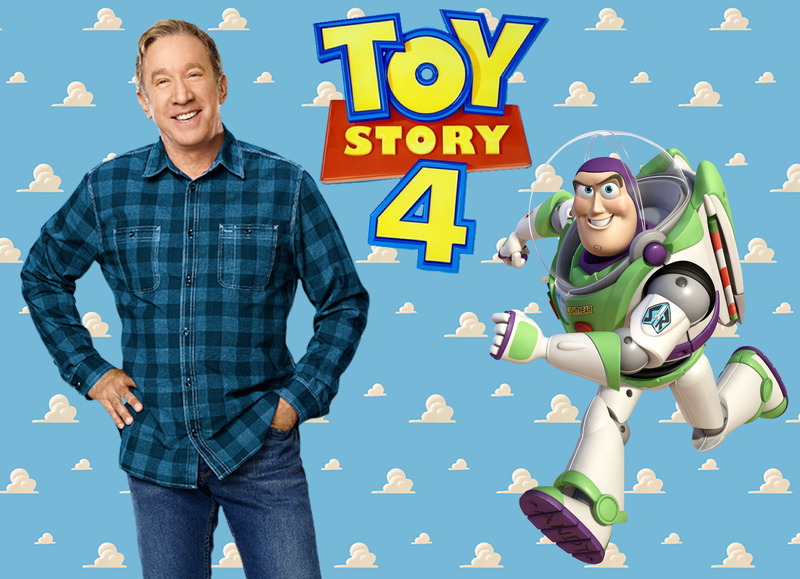 Tim Allen, the actor, and comedian behind Buzz Lightyear's brilliant vocal work has been on a recent press tour promoting the seventh season of his prime-time television show, Last Man Standing. Throughout his stops at various talk shows and print/radio interviews, he's also been chatting about another upcoming project that we're particularly excited about — Toy Story 4. Most notably, yesterday he was on The Talk and noted that although he wasn't going to spoil anything (as he notes in all of his interview), the emotion in the film is so high that he wasn't able to deliver his lines in the final scene without getting choked up. "This is an incredibly great story. It is so emotional and so funny — it's so big (the idea they've come up with), I'm startled. [Toy Story] 3 was, I thought, amazing. This [Toy Story 4]...[I] couldn't even get through the last scene!" Below is a summary of other interviews (radio and print) where Tim also briefly discussed Toy Story 4. In an interview with Entertainment Weekly, Tim notes that although the project isn't finalized, "If it’s anything near the first read through, it is great. Somehow they were able to advance this wonderful story that could have easily ended with number 3 being the best of the bunch. It’s emotional and funny and exciting and different and took it to a whole new level. It walks the line between comfort — you know what’s going on — and discomfort — wondering what’s gonna happen. It’s terrifically emotional. Our friend, Heidi, from Toy Story Fangirl also found two radio interviews (embedded below) with Tim where he dished on some of his thoughts about the film. In the Life of Dad Show, Allen was asked about his impressions of Toy Story 4 as well as Buzz's best character trait. You can listen to the TS4 portion of the interview at 15:00 into the interview (transcription below). Buzz — His best character trait...he’s a little distracted, so he comes off as dim, and I can’t give you the line, but there’s a new character in Toy Story 4 that everybody cares about, and he’ll just say, like very flat, “I think he’s in great danger.” But everybody’s like, “Where is he? Where is he?” “I think he’s in great danger.” I like the fact that Buzz says things calmly, and it kind of settles it down. But, my god with everybody, 'the house is on fire', but Buzz would go, “I think the house is on fire.” I love the fact that he’s calm about stuff. Toy Story 4 — they’re very early in my end of it, but I’ve read the whole thing, got all the way to the end and it’s a magical experience when they can get past Toy Story 3, which was a wonderful, wonderful movie on every level. This is expanded, clever, funny — it’s [Avengers Infinity War], if you like big movies. Infinity War had so many vignettes, but each vignette was a great little movie in itself, and they all fit together. Toy Story 4 is very much like that. It’s wonderful, and it ties it all together. I can’t give away any more, that’s it. It’s just wonderful. We’re just doing the first pass. I’ve done my first full script read with character voice in there and picture. And Buzz is involved in a huge adventure, with Woody and Bo Peep, and other characters that you may have seen and you may have not. There’s a bunch of new characters, a bunch of great new characters. It is a tremendous effort. I’m telling you, Toy Story 4 is wonderful. It’s wonderful, funny, and expansive, and emotional, and I’m telling you, get excited. If you like Toy Story, Pixar and Disney have done a tremendous job. What are your thoughts from Tim's notes about the film? Leave a comment below or chat about Toy Story 4 with other fans in the Pixar Post Forum thread all about the film. When the film was announced, there was quite a bit of trepidation surrounding why a fourth film would be green-lit, but these certainly sound like ringing endorsements to us with a full set of action, characters (new and old), as well as a high level of emotion that we've come to expect from Buzz, Woody, and the gang. On his recent press tour for the premiere of Last Man Standing, Tim Allen (voice of Buzz Lightyear) talked about the emotional script and new characters from Toy Story 4. Read, watch, and listen to several of his interviews in our post.